Writing a book or series of books is a substantial commitment. Authors spend a lot of time and effort avoiding the temptation of shiny new ideas, because chasing other stories will never get you a finished manuscript. But the best inspirations hang around, waiting in the corners of your mind, tugging at your attention until they’ve grown too monstrous and delightful to be ignored. These are the stories that are most fun to tell, the ideas that will not be turned away. I’m happy to report my newest title is just one of these monsters. King of Ash and Bone began niggling at me about midway through the Descendants Series as a simple idea: a magical apocalypse. A heroine with steadfast determination came in next, followed quickly by the handsome anti-hero who just might have what it takes to break her resolve. And of course he would have something to hide that might test them both. I found myself researching end-of-days scenarios in my spare time, gathering images of winged beasts and deserted cities as this new world grew and grew, forming its own brand of chimera and bursting into a second realm, complete with problems of its own. The Shattered Realms series is certainly lined up to be the most complex I’ve ever written, and I can only hope it catches readers’ hearts and imaginations the way it has mine. 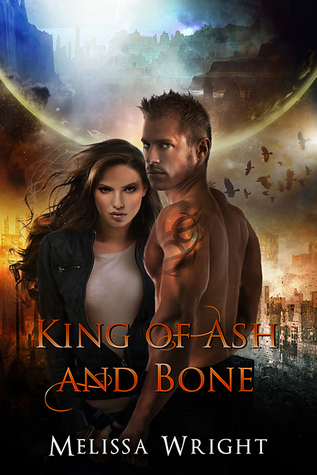 Would you like to sign up to review King of Ash and Bone? Do so HERE! When she finds an injured stranger in the street, he just might be the key she needs to succeed. What Mackenzie doesn’t know is that this stranger isn’t the helpless boy he appears to be. He’s one of the monsters. And he’s got plans of his own.